Autoimmune syndromes with cutaneous and systemic manifestations including dermatomyositis (DM) may occur in patients receiving anti-tumor necrosis factor-α (anti-TNF-α) therapies. We describe a patient with rheumatoid arthritis (RA) successfully treated with adalimumab who developed DM. A 45-year-old women was seen for dermatologic consultation because of onset of erythematous lesions on the dorsum of the hands, associated with intense fatigue and symmetric joint pain on the hands and feet. She had a 13-year history of a severe, erosive form of RA, associated with positive rheumatoid factor, joint swelling, and deformations. She had received numerous therapies including sulfasalazine, gold salts, and methotrexate, with poor response. In 2001 she received 6 infusions of infliximab 5 mg/kg/day, with no response. At March 2003, screening tests including antinuclear antibodies (ANA) and anti-DNA antibodies were negative, and she started continuous therapy with adalimumab 40 mg subcutaneously every 2 weeks, with excellent response. In October 2007 she described a 4-week history of persistent, erythematous-violaceous lesions on the dorsum of the hands, associated with symmetric joint pain and intense fatigue. At examination we observed numerous erythematous-violaceous papules, mainly on the dorsum of the interphalangeal and metacarpophalangeal joints (Gottron’s papules), associated with dystrophic cuticles, nailfold telangiectasias (Figure 1), and Raynaud phenomenon. Skin biopsy was consistent with DM. Muscle strength testing revealed contraction unable to offer resistance in both proximal superior and inferior extremities, and she experienced walking difficulty. High creatine kinase (1400 IU/l), aldolase (14.9 IU/l), and lactate dehydrogenase (810 IU/l) levels were detected in association with elevated erythrocyte sedimentation rate and ANA (1:320). Anti-Ro/SSA antibodies and Jo-1 antibodies were negative. Electro-myography showed myopathic changes in both proximal superior and inferior limbs; a muscle biopsy was declined by the patient. Cancer screening was negative. The diagnosis of DM was based on the presence of symmetrical proximal muscle weakness, elevation of skeletal muscle enzymes, electromyographic changes compatible with DM, and Gottron’s sign1. No improvement was seen after 6 weeks of therapy with prednisone (1 mg/kg/day) and methotrexate (10 mg/week), and adalimumab was suspended after 8 weeks from the onset of the cutaneous and muscle symptoms. Three weeks after withdrawal, the cutaneous, muscle, and joint symptoms began to diminish. Two months after suspension the patient was free of cutaneous and systemic findings and continued therapy with oral prednisone 8 mg/day. 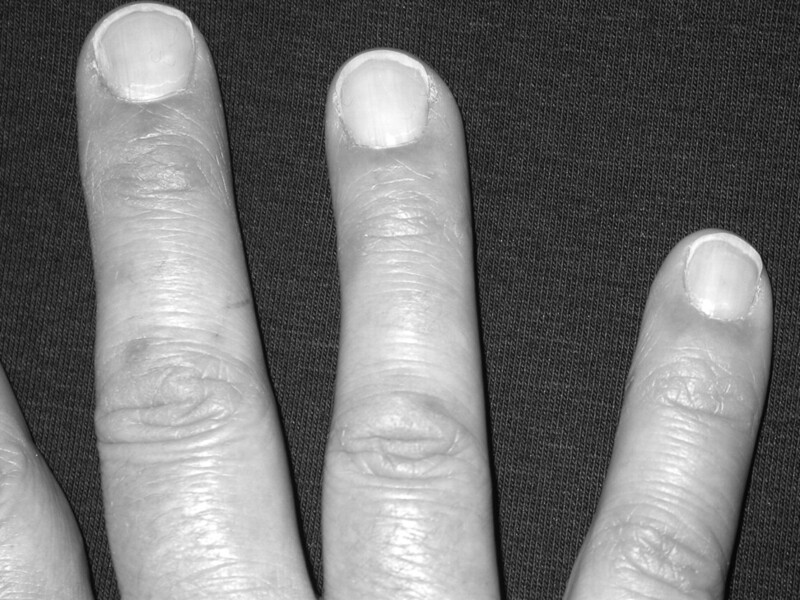 Erythematous-violaceous papules, mainly on the dorsum of the interphalangeal and metacarpophalangeal joints (Gottron’s papules), with sparing of the skin between this joints associated with dystrophic cuticles and nailfold telangiectasias. Anti-TNF-α therapies are now commonly used in a variety of inflammatory conditions including RA, psoriasis, psoriatic arthritis, spondyloarthritis, and Crohn’s disease2. However, concerns have been raised regarding the safety profile of these agents. In our case the onset of DM after 4.5 years of uninterrupted adalimumab therapy and the improvement after withdrawal suggested a probable drug-induced adverse event. Considering the negative autoimmune status of the patient at baseline, the absence of other DM-associated comorbidities, and the positive ANA titer that developed during treatment, we suggest that immunogenicity associated with adalimumab could be the main etiological factor. The emergence of immunogenicity as positive ANA, anti-DNA antibodies, and drug-induced lupus during anti TNF-α therapy has been widely documented3. Skin manifestations such as purpura and photosensitivity in the context of autoimmunity are a well known class effect of anti-TNF-α therapies, mostly infliximab rather than etanercept, with a frequency of autoantibodies up to 50% for ANA and 15% for anti-DNA antibodies2. Two cases of polymyositis associated with infliximab, one case of axonal neuropathy associated with adalimumab, one case of interstitial myositis with demyelinating neuropathy associated with infliximab, and one case of necrotizing myositis associated with etanercept have been reported, but to our knowledge this is the first case of DM associated with adalimumab4. Elevation of soluble TNF has been detected in patients with DM, suggesting a therapeutic role of TNF-α blockers in this disease5. Several investigators have described successful use of infliximab and etanercept in refractory cases of DM; Efthimiou, et al reported that addition of etanercept or infliximab to the standard therapy of DM and polymyositis may be useful in selected cases6–8. Paradoxically, in our patient, anti-TNF-α therapy probably triggered an autoimmune phenomenon clinically manifested as DM. TNF-α blockers inhibit the cytotoxic T-lymphocyte response that would normally suppress the autoreactive B-cell response, promoting humoral autoimmunity9. There is also evidence that blockage of TNF-α causes exacerbation or prolongation of preexisting autoimmune diseases such as multiple sclerosis in humans and mice10. In accord with our findings, Dastmalchi, et al documented a worsening of muscle inflammation during infliximab therapy in patients with DM and polymyositis11. Clinicians should be aware that autoimmune syndromes with cutaneous and systemic manifestations, including DM, may occur in patients receiving anti-TNF-α therapies. In cases in which autoimmunity is suspected, ANA and anti-DNA antibodies should be determined immediately and close clinical examination should be performed prior to drug withdrawal.
. Dermatomyositis. Clin Dermatol 2006;24:363–73.
. Inflammatory molecules: a target for treatment of systemic autoimmune diseases. Autoimmun Rev 2007;7:1–7. Systemic lupus erythematosus induced by anti-tumour necrosis factor alpha therapy: a French national survey. Arthritis Res Ther 2005;7:R545–51.
. Neuromuscular involvement in rheumatic patients treated with anti-tumor necrosis factor therapy — three examples [letter]. J Rheumatol 2008;35:2074–6.
. Elevation of serum soluble tumour necrosis factor receptors in polymyositis and dermatomyositis. Clin Rheumatol 2000;19:352–9.
. Refractory adult dermatomyositis with pneumatosis cystoides intestinalis treate with infliximab [letter]. Rheumatology 2004;43:1196–7.
. Necrotizing fasciitis in a patient treated with etanercept for dermatomyositis [letter]. Rheumatol Int 2009;29:463–6.
. Possible role for tumour necrosis factor inhibitors in the treatment of resistant dermatomyositis and polymyositis: a retrospective study of eight patients. Ann Rheum Dis 2006;65:1233–6.
. In vivo neutralization of TNF-alpha promotes humoral autoimmunity by preventing the induction of CTL. J Immunol 2001;167:6821–6.
. Multiple roles for tumor necrosis factor-alpha and lymphotoxin alpha/beta in immunity and autoimmunity. Arthritis Res 2002;4 Suppl 3:S141–52. A high incidence of disease flares in an open pilot study of infliximab in patients with refractory inflammatory myopathies. Ann Rheum Dis 2008;67:1670–7.